Ryan Slauson, MEET YOUR MEAT, cardboard, clay, wood, paper, acrylic paint, string. 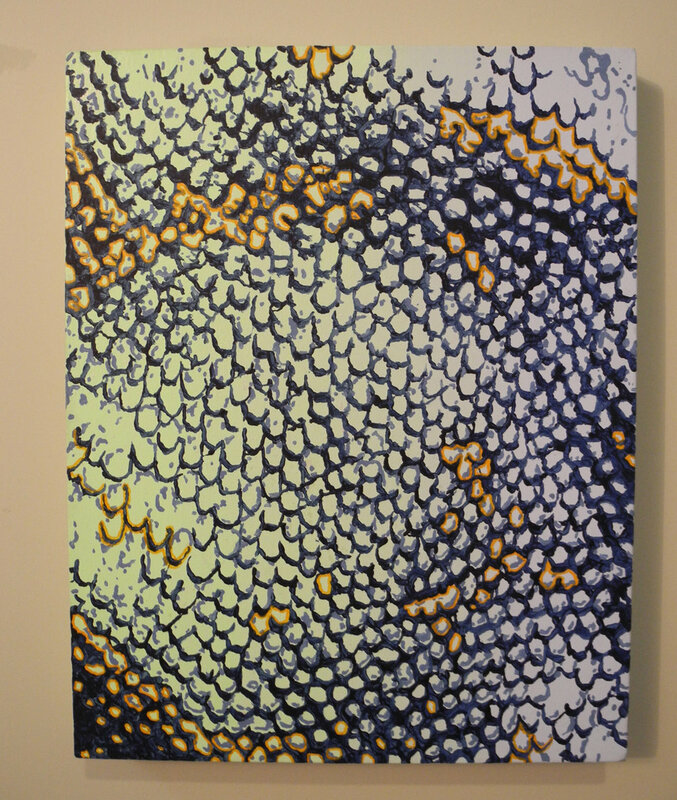 24" x 34" x 40"
Presented in New Rochelle, NY as a collaborative venture with Residency Unlimited. 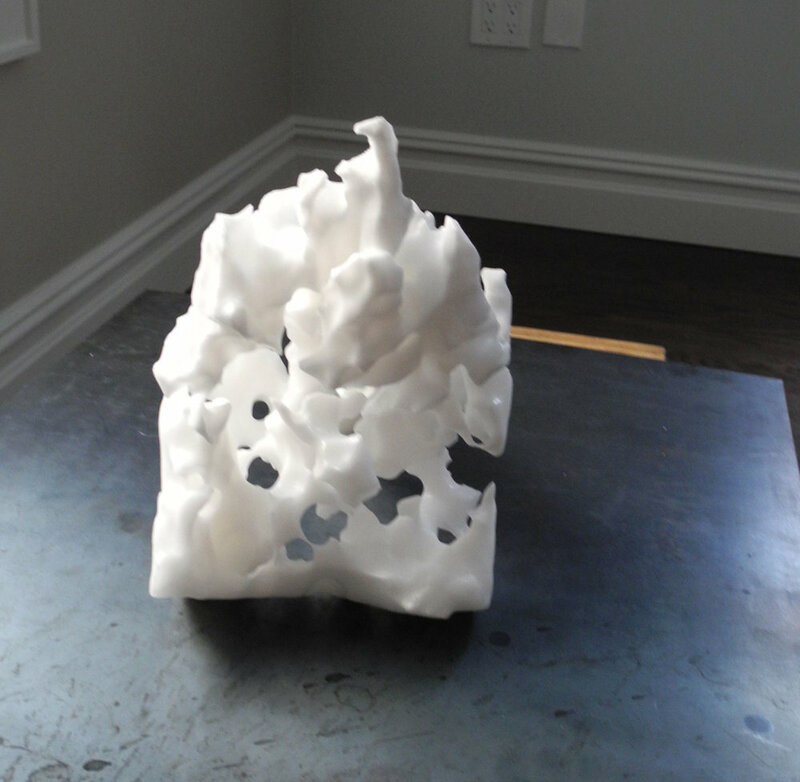 Field Projects is pleased to present Ghosts, curated by Beth Livensperger, featuring the work of Fanny Alliè, Kara Lynn Cox, Hilary Doyle, Erik Gonzalez, Will Hutnick, Mollie McKinley, Jeanette May, and Ryann Slauson. Ghosts takes on questions of transformation, dwelling, and the unknown. The show will be staged at 5 Anderson Street, New Rochelle NY, a downtown building in the process of being gut renovated to produce upscale rentals. As a counterpart to the RU residency conducted in a future retail space, the artists in Ghosts position themselves as temporary apparitions in the building, using installation, painting, sculpture, video and performance to probe notions of occupation and inhabitance. Like tenancy, any art exhibition or performance is impermanent: artists and visitors come together for a celebration, the work makes itself available for contemplation and discussion, and then it is over. Documentation can never capture quite the same experience. Who were the former tenants of the apartments now being used for the exhibition, what their lives were like - and who will be the next inhabitants? The artists in Ghosts would like to send them a message from the present. Whether monumentalizing, sentimentalizing, or shredding notions of home, permanence, and change, the work in Ghosts will exist for only a sliver in the history of this place. This work is a deliberate becoming, staged in a space waiting for more stories. Fanny Alliè’s practice is built on the experience of living in a city: who you pass by, who you know and who you don’t, the fragments left behind in the routine of each day. Whether collage, drawing, sewing, sculpture, or public installation, figures in motion move through her work in constant flux. 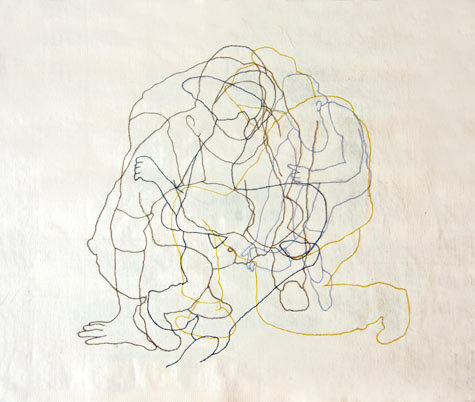 Her spare yet evocative outlines of these figures remind us of fleeting, recognizable moments and encounters. Collages made with cardboard, paper, and wood panel collapse environments, gestures and bodies onto each other to create new structures. image: HORSES, collages and mixed-media on cardboard, 31.5" x 33"
Kara Lynn Cox is a painter who lifts marks and pattern from the world around her and transforms them into luminous abstract paintings. The delicacy of mesh or a confusion of organic marks overlays hyper-colored gradient washes. Cox’s fascination with everyday surfaces such as asphalt, bark, or the weave of a glove which form the grammar of our visual worlds is apparent in the loving treatment she accords to each painted mark. However, her often cold, synthetic color palette and rejection of easy identification of the source imagery hints at an emotional distancing, and her paintings rest uneasily in the balance. image: MESH, Acrylic paint, house paint, on drop cloth, 16" x 20"
Hilary Doyle’s paintings are markers of ordinary domestic moments tuned to a strange pitch via intensive observation. The act of lying in bed with open eyes, or taking one last look at your smartphone before sleep, are translated through keyed up color and exaggeratedly specific surfaces into unfamiliar events. Doyle works from observation in many ways: sketches, videos, iphone drawings and objects themselves become material for her paintings. She often fabricates small sculptural models to paint from. Working out of this deep, multi-faceted knowledge of her subject leads to paintings which are magnetic as both image and object. 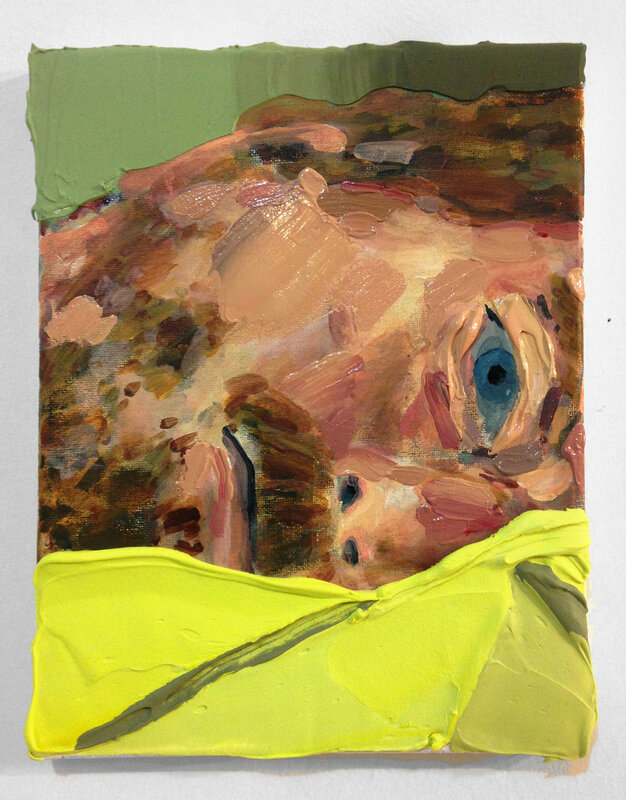 image: HALF-AWAKE, acrylic on canvas, 8" X 10"
Erik Gonzalez is an artist who uses a variety of media to look critically at the ways in which we create and bestow value and meaning on objects and images. His work as an independent cabinet maker has afforded him opportunities to explore various facets of production and consumption as dynamic systems, and has become an ongoing performance called Making Wood Smaller. Shown here is a project called Living the Dream. While fabricating a custom kitchen, he made drawings of the drawers on the bottoms of the drawers, and subsequently erased the drawings when the client was displeased with discovering their existence. image: AR-VAN-D1, archival digital print, 30" x 40"
Will Hutnick’s dynamic and color-saturated mixed media work and installations depart from the givens of a space as well as our understanding of abstract painting. Working in materials such as spray paint, paint marker, paper, and stenciling, Hutnick creates bursts of density and angular, ranging forms. These works expose the choices we make as to what serves as the default for our built environment. White space and right angles are overrun and embroidered with snippets of visual extravagance that seem pulled out of some alternate universe in which maximal pleasure is the norm. image: BUT WE'RE GETTING OFF THE SUBJECT, acrylic, paint marker and spray paint on canvas, 30" x 30"
Mollie McKinley creates sculptures, performs and does video, and uses photography all in service of a multivalent exploration of time, ritual, and decay. Her work perches somewhere at the edge of what people do and what the world does without us. Her salt sculptures start as livestock salt licks, and are hammered, chiseled, power washed and left out in storms until they seem to bear the marks of natural erosion. Their worm-eaten organic qualities contrast with industrial materials or marble which McKinley often pairs with the salt. image: SALT MONOLITH: BLOCK, Salt, Quarter Inch Steel, Approx. 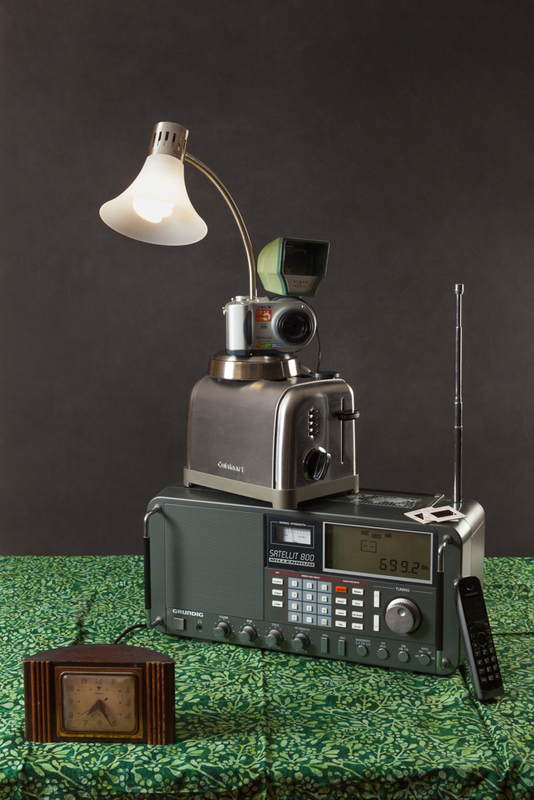 12" x 24" x 24"
Jeanette May’s photographic project Tech Vanitas combines banal consumer objects of various vintages into arresting, humorous, and ultimately sobering tableaus. A coffee percolator and camera bellows rest on a boombox, resting on top of an Underwood typewriter. May nods to vanitas painting as well as the act of looking itself in a play of varied surfaces and light sources, but her ultimate target might be time itself, and how what we prize loses luster with the march of technology, becomes outdated, quaint, and finally vanishes. image: TECH VANITAS: BLUE iMAC, Archival Pigment Print, 36" x 24"
Ryann Slauson makes sculptural installations, performance, video, and drawing which tenderly skewer particularly American markers of traditions and benchmarks such as Halloween, prize ribbons, football, and the ultimate game of politics. She makes oversized papier-mache heads and wears them for performances which deal with authenticity, machismo, pathos and conflict. Objects such as a stack of titleless paperbacks (nonetheless recognizable as the high school classic Catcher in the Rye), backpack with threatening zipper teeth, and a string of Vienna sausages are equally evocative. image: MEET YOUR MEAT (detail), cardboard, clay, wood, paper, acrylic paint, string. 24" x 34" x 40"
Beth Livensperger is a painter who lives and works in Queens, NY. She has exhibited widely, and been an artist in residence at Chashama and the Abrons Art Center in NYC, Vermont Studio Center, and the Kimmel Harding Nelson Center for the Arts, among others. She holds a B.F.A. from The Cooper Union and an M.F.A. from the Yale University School of Art.